Happy Monday! Let’s start this week strong! How was everyone’s weekend? This weekend we did some house maintenance and decorating. 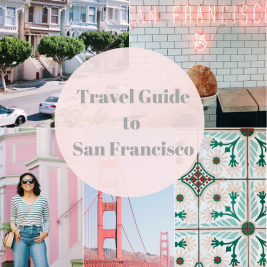 We went to Anthropologie, HomeGoods, Target, and Home Depot to get stuff around the house just to spruce it up a bit. Which was a lot of fun! These are pretty much my favorite stores to visits! Yup, I actually enjoy going to Home Depot haha. I think it is probably because growing up, I would always go with my parents to Home Depot and they made it fun for me. I was able to get some toys from the quarter machines and hot dogs as a treat. So now, I just love going to Home Depot! I want to thank you guys for taking the time to read my post on Friday. Many of you had nothing but the kindest and sweetest words to say. I actually got very emotional reading these messages. They mean so much💗. I am so sorry if I haven’t gotten to thank you yet! I’m getting there! I really do read every comment, message, and email. I really think it is so important to dedicate the time to respond to people who take the time to show support and appreciation. So thank you guys again. I know, I’m wearing another off-the-shoulder top. Can you blame me? 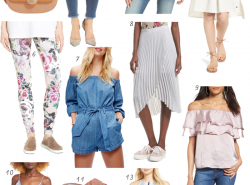 It’s such a fun trend! I was drawn to this top because of the vine embroidery. The details were so beautiful and unique. It’s the perfect statement top for the summer! Doesn’t it look like it belongs in some tropical or exotic getaway?! 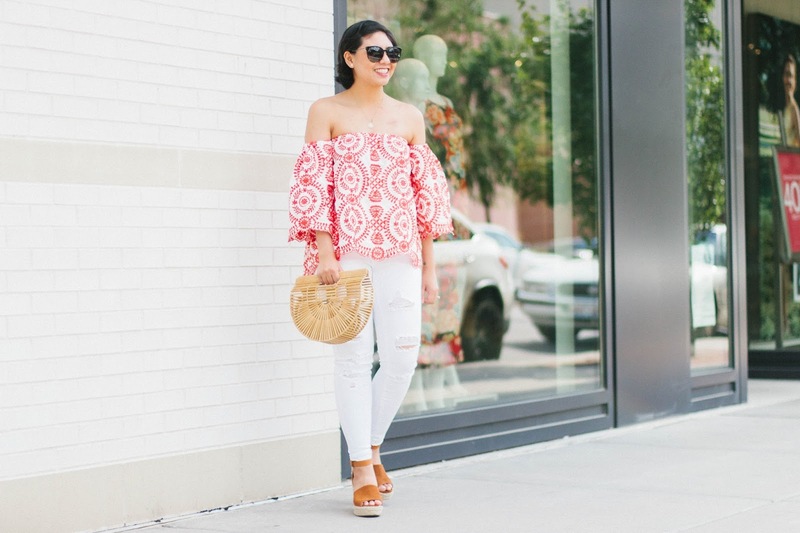 What makes this embroidered off-the-shoulder top so great is that the sleeves are separate. 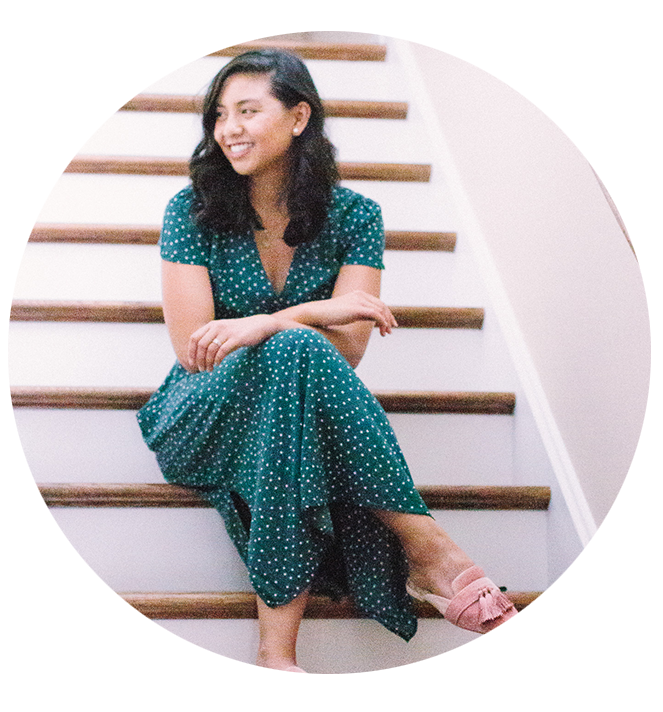 I don’t know about you, but one thing I can’t stand about off-the-shoulder tops is that I constantly have to pull the sleeves down so it continues to look off-the-shoulder. Any movement, and everything scrunches up and becomes a boatneck neckline! 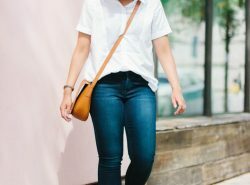 Since there’s a different outlet to insert the sleeves, the sleeves pretty much stay down and the top continues to look off-the-shoulder all day long! So cute! I love the off the shoulder types of tops that are more of a strapless top with sleeves attached like this one. Such a fabulous summer look! You look so cute one, and two I am obsessed with this top so much on you! It is sooo cute! Love! I might need to order those shoes! I never thought of Victorian! I like that! Thanks Abby! Sounds like a fun weekend of decorating! Loving your red and white top with the white jeans! Wonderful look, love the shoes! I believe you'd really like my giveaway, you should participate!! What a wonderful summer top! Love the freshness! 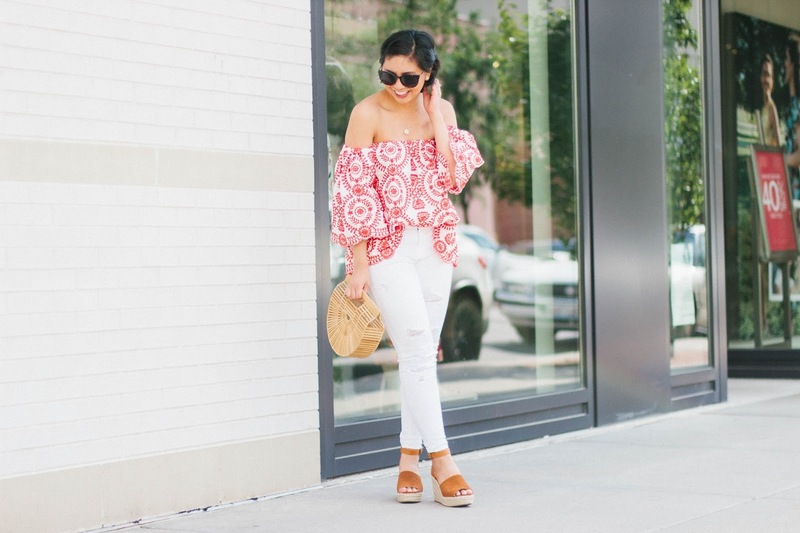 You can wear all the embroidered off shoulder tops you want — you wear them well! And speaking of HomeGoods, a blogger I know said she found a Cult Gaia ark bag dupe at TJ Maxx for like $20! Thank you so much Cheryl! Yes, I heard of that and that's so crazy! I found some dupes too on Amazon! Ive been seeing this top everywhere and I LOVE it! 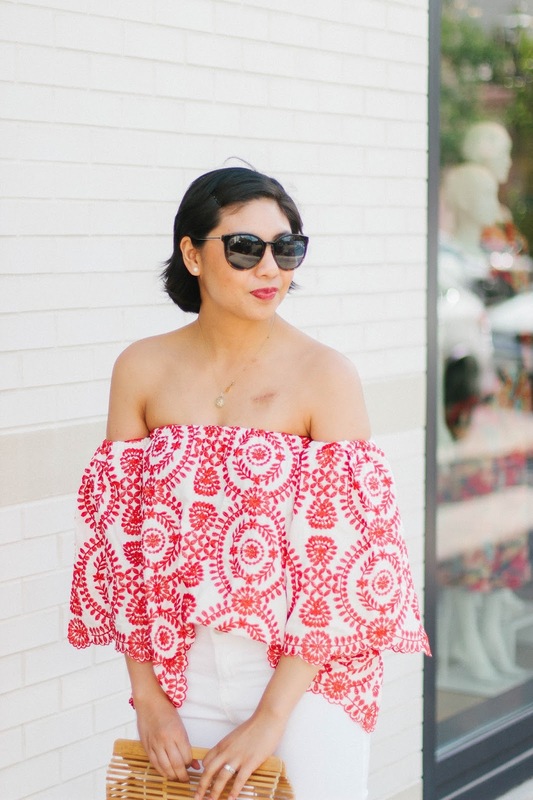 Off-the-shoulder tops are still such a fun trend! I love the embroidered print on this one, it is stunning! So are you! The straw bag is perfection! It totally is! Thank you Vanessa! 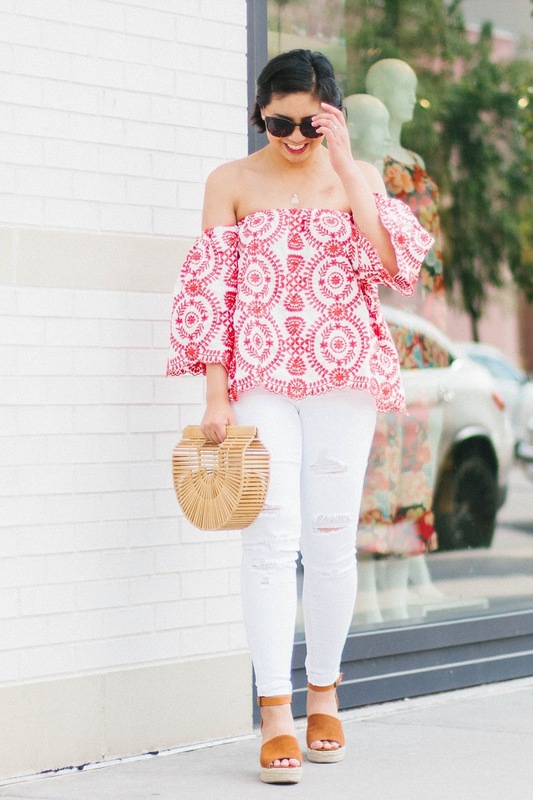 This off shoulder top looks so cute on you! And that bag is so on point for summer look, perfect summer outfit! This top is so gorgeous! I love the white and red combo! This top is SO pretty on you and you look so happy in these photos! Hope you're having a great day! The sleeves are separate?! Whaaaaat, that's amazing. I love that you could totally rock this on the beach or the city. Super cute! I know! SO genius! Thank yo Pia! Such a cute top! And don't you love finding things for the home at Anthropologie =o) They have such nice things! Thank you! And yes! I love Anthro and I wishI can live there haha! You look gorgeous on this off the shoulder top! Most of the tops I've seen this year are blue or stripes. It's always refreshing to see something floral and in this beautiful color! Thank you so much Julia! I thought it was refreshing too! That is one of my fav look from all that I have seen today.Beautiful. Rach, this is so perfectly styled! I love this top with the white jeans and the bamboo bag! The top is so beautiful and like how you paired it with white pants. This is like the perfect summer outfit!! I have these jeans and shoes 🙂 These Steve Maddens are a perfect dupe for the Marc Fisher Espadrille's for a fraction of the price! 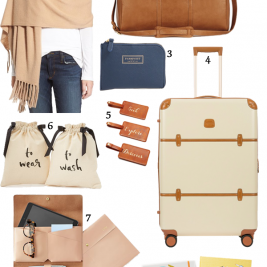 I have the taupe color but I kind of want this cognac color too, ahh. Thank you so much Allie! I totally agree with you! I would love to have it taupe! This outfit is so perfect for summer! I love that top. It is gorgeous!! Yes Rach, this top is a must-have! I love that embroidery! I love this outfit! The print on that off the shoulder top is to die for! this is such a beautiful and gracious outfit. you look gorgeous. Wow, so nice!! I love the top so much!! Amazing look! Que monada de look, estas guapísima. This top is so pretty! Love it a lot. THe OTS blouse is just VOW!! YOu look so beautiful here. I love the print on that top! Looks so good with the bag! Cute top! I've seen that same purse making rounds with all the bloggers too, hehe. Very stylish! That top is so pretty! I love the embroidery! This is literally gorgeous on you!! You look stunning. I love this fresh and summery look. So perfect on you. I love this look on you! That top is such a pretty color and has great detailing. I also need to work on sprucing up my apartment. Thank you Alicia! Def recommend Homegoods! What a gorgeous outfit Rach! Love love love that top. And I didn't get the opportunity to comment on your last post but thank you so much for sharing your journey. I know it hasn't been easy but you are such an inspiration! Thank you so much Heidi for your kind words! What a beautiful of shoulder top! You look beautiful! This top is so cute! I lovelovelove it! Ohhhh this embroidered top is super gorgeous! I love Chicwish! Thank you Tina! I love Chicwish too! Wow! 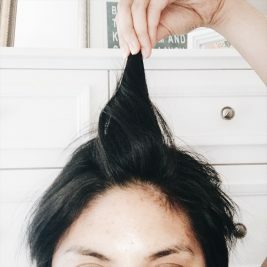 This is such a cute look 🙂 You look so pretty 🙂 Wonderful post dear! Stay in touch. That drives me crazy about off the shoulder tops too! That tops is so cute and perfect for the summer!